Citation: Acquaye, Hannah, “The relationship among post-traumatic growth, religious commitment, and optimism in adult Liberian former refugees and internally displaced persons traumatized by war-related events” (2016). Electronic Theses and Dissertations. Paper 5071. In West Africa, Gregory and Prana (2013) undertook a study with Ivorian refugees in Liberia. The researchers wanted to determine if posttraumatic growth would increase measurably among Ivorian refugees if they learned the 10 modules taught in the Companion Recovery (CR) model. The CR model is accomplished through a collection of counseling theories including Gestalt, Cognitive Behavioral and Traumatic-Incident Reduction. They had earlier discovered that this model was critical in an environment whose membership fluctuated, who had limited funding, and whose staff members were stretched beyond their abilities. According to them, the CR model was proven to reduce PTSD symptoms in a sample of child soldiers. For their study, fifty Ivorian refugees experiencing profound catastrophic trauma (the loss of the three fundamental levels at the base of Maslow’s hierarchy of needs; Maslow, 1970) were given the CR training. 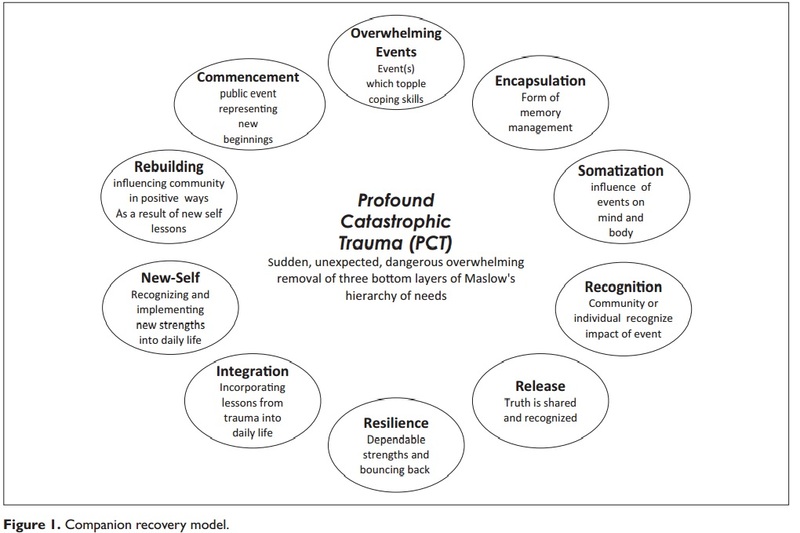 The Companion Recovery (CR) model comprises 10 modules placed in three sequential categories. The first is trauma impact reduction and education (overwhelming event, encapsulation, recognition). The second is resilience (release and resilience), and the third is posttraumatic growth (new self, rebuilding community, and commencement). The CR models include group training where participants learn to recognize the impact of trauma on the mind and body. Participants are then taught to select a companion who will maintain confidential and effective communication skills. Understanding and embracing of the concepts of the 10 modules help participants to become expert companions necessary for posttraumatic growth. Results from this intervention indicated that participants discovered a new self when they identified the power of surviving the profound catastrophic traumatic they had experienced due to the flight from conflict. Results further indicated participants’ pride in rebuilding their social structure and it helped them reach out to help their communities in a positive and meaningful way; a connection to the new possibilities dimension of posttraumatic growth. The TIR Value-Centered News September 2016 issue (No. 1) is now available. Each issue will feature a brief, but informative post about what is important in the nature of traumatic incidents, personal development, and other Applied Metapsychology topics. Please subscribe using the online form to be the first to find each issue. Traumatic Incident Reduction (TIR) is a client-centered approach that I like because it is usually very effective in a short amount of time. It allows me to get out of the way so the client can find her own solutions — often ones I could not possibly have thought of. They work for the client because they are her own. TIR, when applied correctly, diminishes or eliminates the negative impact of traumatic events for most people, making it an excellent choice for treatment of trauma. It is a time-efficient, one-on-one method in which the client repeatedly recalls a traumatic memory under the guidance of a trained practitioner in a safe, secure situation with no distractions. In my personal practice, I have used TIR with clients who have dyslexia, ADHD, and autism — clients who are not always good subjects for traditional, reflection-based therapies. TIR is solidly based on the foundational work of Sigmund Freud and Carl Rogers. Cathy Dodge Smith has 50 years of experience in special education and psychology. She is the owner and Director of ADD, Dyslexia & Autism Associates Inc. in Oakville, Ontario. During her career, Cathy has worked as a teacher at elementary school, community college, and university. She has a master’s degree in vocational guidance with a specialty in learning disabilities, and a doctorate in human development and applied psychology.